The current popularity of MOOCs is like the running of Olympic Games, where different MOOCs are competing with each others in a global arena of education. The emergence of MOOCs has touched the nerves of many college and educational leaders. To some educators, professionals and learners, MOOCs seem to have become the hype of education of the year. To others who are working as professors, educators and administrators, MOOCs have become part of their institutions’ growth and development, especially so in institutions like Coursera, Udacity and edX and the associated universities. To some learners in the developing countries, MOOCs have afforded them with opportunities to learn from the highly prestigious institutions in the world that they couldn’t even dream of in the past. So, MOOCs values could be viewed differently for different people. It surely could be one of the most significant trend in this time of flux in Higher Education. This paper aims to examine, explore and reflect on the following themes: the paradoxes, drop out problem, pedagogy, the emergence and the future of MOOCs. I would recommend solutions to these challenges based on a mega-research of MOOCs and critical reviews into current pedagogy adopted by Higher Education institutions. Further research into the educational values and value proposition of MOOCs is necessary to unearth its long term potential in re-creating or revolutionizing Higher Education. What are the paradoxes in MOOCs? MOOCs, like open educational resources, provide a genuine opportunity to spread an institution’s educational mission outside the campus. Elite institutions offering MOOCs will therefore never allow them to become as credible as their regular fee-incurring provision. There are motives of elite institutions that are highly sophisticated, and that could go beyond their current missions. One of the most important visions and missions is based on the need to maintain their global leadership position in distance, online and open education. This could be one of the reasons why those institutions are interested in adopting the MOOC model and platform as they could reach massive number of learners and students across the globe. The adoption of MOOCs could also be built on the imperatives that education is the foundation of a knowledge based economy in their nations. Besides, online education is a billion dollars business. There is also a need to explore and research on how students learn online, which will enable the institutions and teachers to enhance their teaching for their regular students. A paradox that underlies MOOC is its value proposition to lower costs due to its Massive Open Online nature. Whilst the buzz about MOOCs is not due to the technology’s intrinsic educational value, but due to the seductive possibilities of lower costs (Vardi, 2012). This could also reach a massive number of potential learners, on a global basis, as a result of technology, yet it may not add substantive costs to the MOOCs, once they are created. Another paradox lies with the degree of participation – the drop-in and drop-out in MOOCs, and how success in completing the course or learning is defined. As Rebecca mentions here: to her, there seems to be one level of participation in most x MOOCs. You got to register into the course before you could view the resources, or the video lectures. For some of the x MOOCs, however, you could choose to lurk, or formally complete the course work required. if you simply wish to lurk, or pick-and-choose how you participate, you may very likely be counted as a “drop-out” rather than someone who succeeded in the course at the level in which they committed. I think this lack of levels of participation does a disservice to the xMOOCs. This could be a determining success factor of MOOCs, as the number and percentage of successful “graduates” or those who could complete the course by satisfying all stipulated requirements of the awarding institution or professor is critical to such courses. These pass rates are important in deciding if it is a cost-effective model of education, as determined by the institutions. Indeed, all institutions would need to justify their investment in education and the associated resources provided – including the professors, the administrators, the support staff like librarians, the facilities, and the technological infra-structures. This would likely be based on the number of graduates or completion of units in the educational programs, as that could also be the basis of funding provided by the government or relevant bodies in society. What are the most significant problems in MOOCs? Drop out due to a mismatch between the course offered and the needs and expectations of the participants. To what extent are these 3 hypothesis reflective of the reality in MOOCs? Kop et al. 2010 reveals in their research that: barriers to learning include zone differences, language differences, difficulties in connecting with others in different spaces, lack of skills in the use of tools, difficulties in making connections with facilitators and/or learners, and power relations. Furthermore, a high number of participants mentioned personal reasons, such as lack of time to participate, as explanations for why they took on more of a consuming role in the course rather than an active, participative one. These all could lead to “drop-out” at various stages of learning in MOOCs. What could be some plausible ways to decrease the drop-out rates, and increase the level of participation in MOOCs? These are questions which need to be addressed both at an institutional and research level. Drop out due to non-educational reasons are naturally not easily resolved, as they may be due to personal reasons, and could hardly be addressed through education intervention. What are the pedagogies adopted in MOOCs? It is well established that a professional soliloquy is an ineffective way of teaching. Active and authentic learning – based on projects or problem-based learning, peer learning and flipping the lecture has been hailed as the panacea to the traditional didactic teaching, where much of the academic teaching still consists of professors monologuing to large classes. Vardi comments: We could undoubtedly improve our teaching, but MOOCs are not the answer to our pedagogical shortcomings. this comprehensive critique on MOOC entitled making sense of MOOC by John Daniel. I doubt if xMOOC learners preferred teachers to scrawl formulae on blackboard (or that on Youtube). What learners are looking for could be interaction with the instructors, if ever possible in those type of presentation. Learners who are keen to learn through dialog would prefer to raise questions, when in doubt of the content or unsure about the concepts explained in the presentation. It is a rather passive way of learning by watching the instructors “broadcasting” their short video lectures. I reckon the use of ICT is just part of the solution in Higher Education, especially when the focus is shifted towards higher level, deep and meaningful learning. The networked operating system gives people new ways to solve problems and meet social needs. Whether MOOCs could heighten learners to such a level of networked learning is still mooted. I would however, think there are still lots of positives and potentials in the MOOCs, as I have shared them in the past posts. Though there are lots of criticisms on x MOOCs, I think institutions are using these opportunities to steer the changes needed in Higher Education. This is perhaps a time of huge change for Higher Education that would leave a huge footprint in its landscape. There is simply NO RETURN. I have made some proposition about the MOOCs here. What would emerge out of the MOOCs? Those MOOCs which could leverage technologies, automate the whole educational process of teaching, assessment and certification, and those which are operating under a sustainable business model – with a continuous stream of revenues and profits to support the design and running of the MOOC. The focus would likely still be on the business, with technology enhanced learning as the way to educate and learn, supported by the super professors, with videos-based teaching, and flipped classroom. This seems to fall in line with the current x MOOCs where huge enrollments – million with Coursera, and hundreds of thousands with Udacity and edX. The third type of MOOCs are those which would re-brand themselves, attract and sustain more educators and learners to be on board of the bandwagon of MOOCs, where an educational model is blended into the business model. Here the super professors and educators would re-reconfigure the teaching to “teach the world”, and support learners in grouped or networked based learning. The focus would likely be on the education process, with technology and social media/networks as an enabler. This could be a hybrid structure of x MOOC and c MOOC. Finally, what would be the model that emerge? What would be the future of MOOCs? 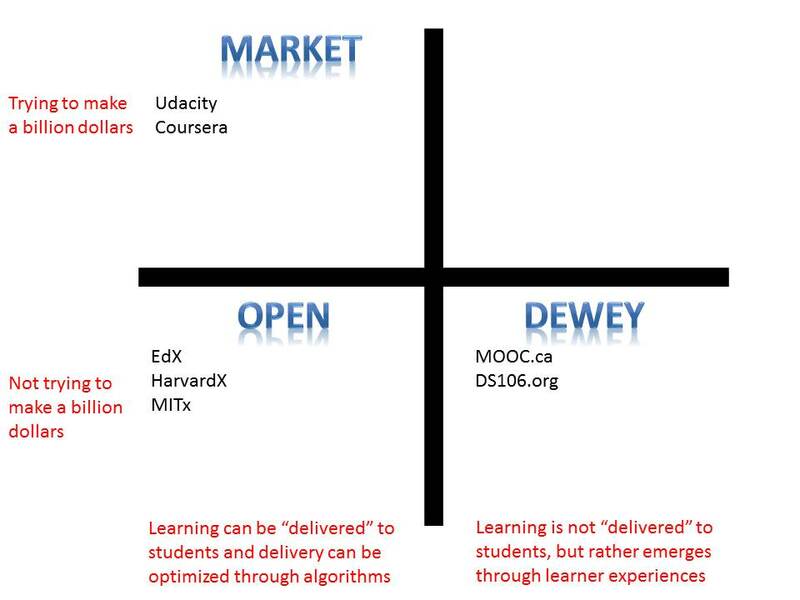 As discussed, the three sorts of MOOCs would serve different types of learners differently based on what the institutions would offer and what the learners might need and expect. There are no clear crystal balls in accurately predicting what would emerge out of these winners, though it is for sure that the ultimate model of Higher Education would likely go with xMOOCs within the coming decade, as the demand for qualifications, formal teacher-based education is still the norm. There is a possibility of having institutions adopting a hybrid approach in blending educational model with a strong business model in order to sustain in the long run. This means that more emerging technologies would be adopted to replace the current teacher-based model of teaching, where the core business of education is more widely adopted not only in higher education, but also being adopted in the wider community and networks. Here the c and x MOOCs would likely be the ones who could embrace both entrepreneurial and educational models in their MOOCs, in the delivery of pragmatic results and tangible outcomes. This may however, mean that they could have the most disruptive effect on the current Higher Education, as they might transform the nature of business of education. There are however, certain institutions who would embrace the learners as center of education model, which in fact mimic the adoption of internet and web-based learning, with a Constructivist and Connectivist approaches towards education, where teachers, social and personal learning networks, artifacts and internet based open-resources and open learning are used in the MOOCs’ platforms, as a basis to truly transform both the institutions, and the nature of education and learning. These require a systemic change in the way learning is considered, that is in keeping pace with the rapid changes in society and needs of learners, with an emergence model of education. There is an urgent need to conduct mega-research of MOOCs and critical reviews into current pedagogy adopted by Higher Education institutions. Further research into the educational values and value proposition of MOOCs is necessary to unearth its long term potential in re-creating or revolutionizing Higher Education. What are some of the possible remedies and solutions to the challenges to MOOCs? 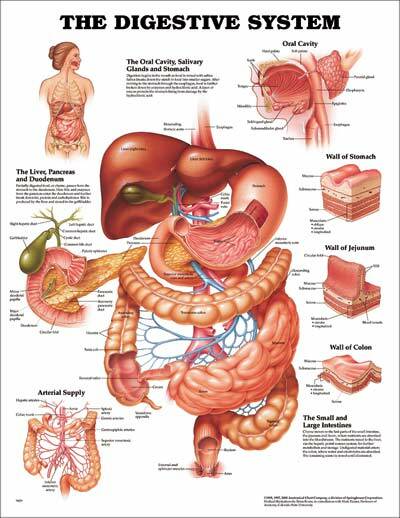 These would be examined and explored in future papers – Part 2. #Oped12 #MOOC Have people really understood what a great MOOC would look like? What does a great MOOC look like from learners’ perspective? Through reading this post on MOOC, it seems to me that the principal pedagogy of instructivism with a sage on the stage (with one SUPER PROFESSOR) teaching in a MOOC is emphasised in the x MOOCs. Isn’t that the way most people are perceiving the x MOOCs (or the super MOOCs) too? I think people might have got the whole ideas of MOOC too much relying on “teaching quality” alone. To me, MOOC is about LEARNING! In an ideal learning ecology, learning (and teaching) should be focused on the learners’ needs, NOT just what the teachers want to teach. If MOOC is only about teaching, then the educators and designers need to be mindful about what is needed to support education and learning. This is why Niazi has been struggling with the MOOC, when she couldn’t reach the media (Youtube) of instruction and assessment that she wanted. There are indeed so many roadblocks and distractions when learning online, that everyone has a story to tell. But is it really what the learner wants? How could we support our fellow educators and learners in MOOC? Isn’t it interesting to learn about students’ wishes, to learn from ONE professor only in a MOOC. It is important to learn from professors and experts on specialized knowledge domain, in MOOCs, and I would fully think that is valuable from a learning perspective. My questions are, however: Is it good enough? Why? Why not? Especially in the case of online learning, and MOOCs. The problem with the learning with an instructivist appraoch with ONE BEST TEACHER, might have assumed a knowledge transmission model in pedagogy. This way of teaching would lead us to believe that if the teacher teaches “best” with the short video lectures, or the “flipped classroom”, then the learners would learn best. What are the assumptions made here? Have we considered the motivation, the learning styles, the learning context and need for personalized learning here? Perhaps, not much. Or may be one could argue, these need not be considered in the case of “mass education” or, these are not THE HELPFUL questions to ask in MOOCs. Without considering these basic assumptions, I don’t think we have addressed the core challenges in teaching and learning, when designing and delivering online courses such as MOOCs. What is more important is not the mere consumption of the content of the course (MOOC), but the application of theories and LEARNING (such as networked learning) into actual practice, in the learning process and journey. The assessment is just part of the learning, though it could play an important role when it comes to accreditation and certification of learning in formal education. Learning is not just about certification alone, and so is not about getting a high grade, just to beat your other learners or to compete with others, and be the 1 or 3% genius on the top rank. That is the traditional way of assessing and measuring students’ performance based on an elitist approach, in order to screen students – from the brightest to the worst students. Does it help the students to perform better, just by testing alone? No! That’s why we need to provide plenty of options, opportunities of learning, and time for our students to keep practising, reflecting, and learning through different means – interaction with the professor(s), experts, other educators, peers, learners, industry specialists, and communities and networks WITHIN AND OUTSIDE the MOOC. Learning in a MOOC takes its roots from conversation, interaction and new ways of thinking and practice takes place, in ourselves, with the network, and among the networks and community. Learning would then relate to the achieving of personal goals, developing one’s learning strategies and literacies whilst constructing and navigating the networks. Creating a simple LMS is not simple, particularly when you are trying to align curriculum and instruction with modern constructivist pedagogy while simultaneously transforming a giant mob of participants into engaged community members. Mr. Thrun is talking like a true Silicon Valley entrepreneur. “The AI class was the first light. Online education will way exceed the best education today. And cheaper. If this works, we can rapidly accelerate the progress of society and the world. Will online education way exceed the best education today? Postscript: Watch this video presentation by Sebastian Thrun. Rockstar professors – sound like a return to education by the SUPER PROFESSORS AS FIRST CLASS CITIZENS, NOT THE RESEARCHERS! Sebastian admitted that a 25 years old graduate who taught in the Physics course in Udacity could do a better teaching than him, as a professor. That sounds interesting. But what is good teaching? Is it just using multi-media to teach? Or should it be more than just posting “great videos”? How about facilitation skills of a teacher? How about a visionary teacher who could mentor and guide learners towards learning (in learning metacognitive skills), and learning how to learn? 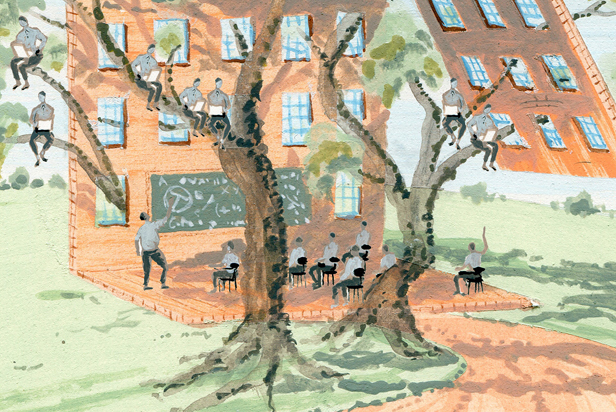 Should we focus more on adaptive learners and adaptive learning instead? I still have reservation with the PUSH approach towards learning in online learning, where education is pushed to the students. Is Khan Academy using an open PUSH or PULL approach towards learning? Your view is important. Here is a post about MOOC and Sebastian Thrun’s presentation. What is the highest form of learning? Most of us have undergone years of learning in our formal school education. Such form of formal education has been designed to help us to become a knowledgeable and responsible citizen. I often wonder how we could continue learning after our formal schooling, especially when we join the “University of Society”. What is the highest form of learning in life at this digital age? How would people learn best? Under what conditions would people learn most effectively? Would learning in the form of self-organised, self-paced and exploratory be one of the highest forms of learning? Here learning becomes a part of the learner’s life. It assumes that a learner is self-motivating, with a passion of continuous learning based on his/her interest and needs. The learner may have to endure numerous failures and mistakes, or stumbling blocks in his/her learning journey before he or she could appreciate the joy of learning. That is where self education plays a role in our life after formal education. Here are some compelling arguments presented by Shimon Schocken on the importance of self-organized learning, and the benefits of learning with a MOOC. What platforms, technology, tools and social media will be used in communication and learning in MOOCs? Andrew says in his post: “cMOOC teaching methods also demonstrate that the LMS (Blackboard/Moodle) is no longer the essential tool for delivering eLeaning. Yes you need a delivery platform but on a cMOOC you must also as a student make use of social tools such as Google Docs, Twitter, Youtube, blogs, Storify, Facebook and other means to connect with and discuss the content, student generated content and each other.” Yes, that’s where most post-graduate students and HE educators are practising, the PLE/N approach instead of the LMS. When I first attended the CCK08, I realized the use of LMS/VMS for forum discussion, but then once the students were “overwhelmed” with the information and discussion threads, or that they found they have learnt enough about forum postings and commenting, they would resort to other sources of social media platforms of their choice – FB, Twitter, Google doc., blog postings to establish their voices and to share views or ideas. LMS/VMS will likely be viewed as the springboard for further initial connections and discussions. LMS/VMS would however be an important tool for use by teachers and professors, as they could use the “learners logging in and commenting” as evidence of interaction, and could assess learners’ capability in facilitating or responding to forum postings. For autonomous educators and learners who are learning via the broader networks, with webs and internet, it seems that blogging would likely serve their needs better in “broadcasting” and reflection of their learning or teaching. 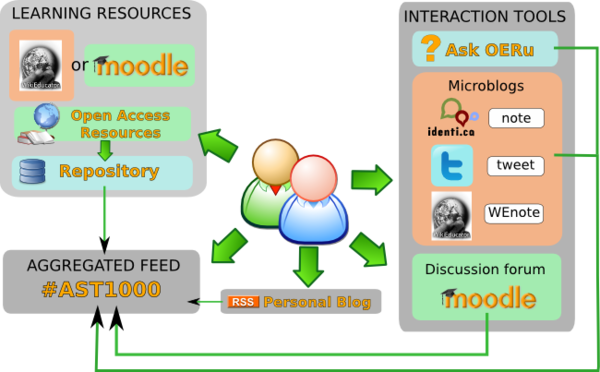 Forum and network platforms such as Moodle, FB, wiki would then be “gateways” for open sharing and discussion of ideas. Twitter would be ideal of information links and dissemination of news and sharing of links to blog posts or event updates, and real time postings of presentation or conference. How far would institutions be ready for the decentralized approach (i.e. Connectivist learning) be adopted in online education and MOOC? I think it is too early to come up with an unique solution based on such decentralized, personalized learning that is feasible for the institutions to adopt as yet, due to the many factors such as economics (as the current MOOCs are free), accreditation, management and control of course and teaching, and most importantly, how these approaches would impact on the mainstream courses and the students involved, with a centralized learning approach. There are however, signs that an aggregated learning approach with a LMS (Moodle), interaction tools (Twitters) and personal blogs in the MOOC would be adopted in the OERu. It seems that the many urges for more open and personalized learning from the x MOOC participants would lead to a hybrid approach towards learning in MOOC – where the c and x MOOCs would likely be adopted in the refined MOOCs. There are already early signs that these approaches are considered and adopted in the recent developments in Udacity and Coursera (Study Room). (1) Even great teachers often know more about what of their “tricks” works than we know how and why they work and for which students. (2) Teachers are no different than any other human. (3) It is ridiculous to think that MOOCs should only be about teaching skills. Do MOOCs today teach us about learning? Not yet. But they have the potential if we ask the big, right questions. Do MOOCs work? What value do they add and for whom? How do they add value? Do they supplement other forms of learning or substitute? Do they replace the classroom or prepare for it? If they prepare for the classroom, how can they help us transform it? What new can the performance of hundreds of thousands of online students tell us about motivation–especially the motivation to learn versus the motivation to be certified? There are lots of assumptions here about teaching, learning and c and x MOOCs. 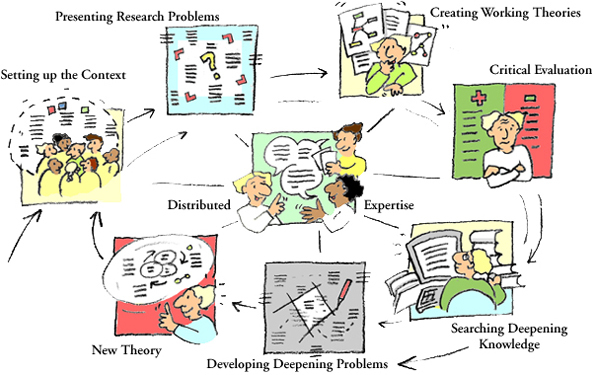 people construct knowledge via a constructivist pedagogy – with an expert. There are certainly some blurring boundaries and overlapping between the two sets of assumptions, and I don’t claim it provides a complete picture of the reality. Finally, I think it is up to the educators and learners to consider what might be aligning most with what they perceived would be the ideal learning for them, as I have also shared them in my previous post, relating to the matching of teaching with learning – and matches of teachers and learners. We are trying to evaluate MOOCs using the typical standards of value, quality, and certification as set by institutions, education authority, and the corresponding criteria of educational/business standards. We are also trying to evaluate MOOCs using Wisdom of Crowds – Crowd sourcing, bloggers’ comments, forum discussion, COPs etc. Is that how we would evaluate the effectiveness and efficiency in education in the case of informal learning, non-formal learning and the xMOOCs? What do xMOOCs try to address? What makes great teaching in x MOOCs? Why use flipping the classroom approach? How effective are the video lectures in learning? What are the merits, demerits of xMOOCs? Are they effective in deep learning? What stimulates and inspires deep learning? Finally, what are the educational values of MOOCs? What do learners want and achieve with MOOCs? See my previous post on flipping the classroom. Participants reported that short video lectures are significant improvement over traditional lectures. I have also tried some of the video lectures of x MOOC myself. Throughout the videos, short quizzes in the form of multiple choice or true/false were used to check on participants’ understanding of the concepts as explained in the videos. Besides, one could pause the videos, or repeat watching the videos until full “mastery” of the content is achieved. When the participants still have questions over the topics presented in the video lecture, they were advised by the professors to join the forum or to form study groups to explore the questions further. The merits of MOOC include anyone with an internet connection can attend for free. This enables people all over the world, including those who live in remote regions to access high-quality university education. There are substantial merits with xMOOCs as cited: open, portable, and interoperable. Many professors have welcome the use of xMOOCs in reaching tens of thousands of learners from around the world (see here). Learners have also reported favorably in their learning through the xMOOCs (see here). Here I have summarized some of the responses from different stakeholders from xMOOCs. Another post on Ann’s experience of xMOOC here. I have posted the review of MOOCs here by Sir John Daniel, also mentioned by Tony Bates here. What is learning? Peter Sloep posted here in response to a post by Steve Wheeler. One of the characteristics of learning through digital media is the ability to crowd source content, ideas and artefacts, and to promote and participate in global discussions. That’s why I want to ask the questions: What is learning? Does it differ from learning prior to the advent of global communications technology? Does learning now require new explanatory frameworks? When theories get more accurate, the concepts that feature in them become defined more precisely but they also become more specific, ignoring parts of the original concept. This suggests that the term ‘learning’ has different meanings in the different learning theories we have. Indeed, this is what Knud Illeris suggests. Learning qua mental activity belongs to the realm of psychological theorising, with such theories as behaviourism, instructionism, cognitivism, constructivism. Learning qua interaction process is much less easy to pinpoint in terms of an overarching discipline. But such fields as sociology, social psychology, game theory, network theory, artificial intelligence, computer science seem relevant. Stephen recently wrote: Knowledge is, on this theory [of Connectivism], literally the set of connections formed by actions and experience”. This seems to touch upon learning qua mental process. Indeed, he seems to want to ignore mental processing entirely, suggesting they are not relevant, epiphenomena of networking at best. When it comes to theorizing learning, I think there are few assumptions we have all made across all theories. 1. Learning is definable and context based – personal and or social, 2. Human learning is an action and experience, that may be conceptualized by sensing the pattern (knowledge embedded), and its associated changes (in behavior, one’s way of thinking, or minds etc. ), 3. Human and machine learning could be understood based on heuristics and algorithms, which in turn could be proven on scientific grounds – with logic and reasoning as the proven forms of learning – in critical thinking, 4. Human learn best under certain conditions – in an authentic learning environment, with technology and tools as enablers, and social and teachers’ support in the case of classroom environment etc., 5. Social and emotional aspects of learning could determine how human would learn based on the interaction between the agents- human and non-human, especially in a technology-mediated environment. These relate to the socio-technological dimensions of learning, which could only be studied at a macro-level of learning. In summary, I think we are talking about learning at a micro level – psychological/neuronal/conceptual (i.e. behaviorist, instructivist, cognitivist, and connectionist) to a macro level (i.e. constructivist (project and problem based), social constructivist, sociological and community basis). Here Connectivism could consist of connectivism (as Stephen has mentioned of both knowledge as pattern, and knowing as pattern recognition, and learning as the navigation and construction of networks in our minds (the neural networks) and Connectivism- that of action and experience we gained through navigation and construction of those networks on the web or social interaction. Here the three levels of network formation – at neural, conceptual and social level with external sources (social webs, networks, communities; artifacts, information etc.) would form the basis of all design – under Connectivism model (with a network learning – learning on networks and NETWORKED LEARNING – where learning is the network). The metaphors of networks as the basis of learning would come into play, as fundamental assumptions of all human learning. 2. Connectivism addresses the principles of learning at numerous levels – biological/neural, conceptual, and social/external. This is a key concept that I’ll be writing about more during the online course. What I’m saying with connectivism (and I think Stephen would share this) is that the same structure of learning that creates neural connections can be found in how we link ideas and in how we connect to people and information sources. One scepter to rule them all. Postscript: The questions of “Does it differ from learning prior to the advent of global communications technology? Does learning now require new explanatory frameworks?” would depend on (a) assumptions one has made, (b) the lens and the corresponding metaphors that one would use to describe and explain the learning phenomena, and (c) the degree of matching of those principles of learning between what one theorizes and one observes and senses, based on a collection of views, personal perception, and reasoning, with empirical evidences. Here I have shared my views on authentic learning.